Zeigarnik was a Russian psychologist from the early 1900’s who noticed an interesting phenomenon while dining at restaurants. 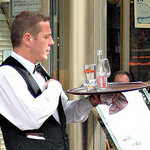 Waiters could easily remember the orders of their guests… until the check was paid. At that point, waiters had problems recalling the meal details. It was as if the waiters’ memory banks were cleared. Zeigarnik researched this phenomenon more and discovered there was a sort of psychological anxiety that kept the waiters involved in the process until there was closure – in this case, the closure of a paid check. So how does this fit in with procrastination? If you can start an activity for just a few minutes, you’ll feel an unconscious pull to finish it. The momentum will then shift, and the urge to procrastinate may fade. Next thing you know, that unpleasant task will be completed.